10 days ago I was at my Aunt’s house in Shillong trying to get some sleep before my first ever astronomy talk at a school. Shillong is the state capital of Meghalaya in north-east India, located some 5000 feet above sea level. The city itself is chaotic and overcrowded, with houses springing up anywhere they can be squeezed in and traffic jams like you’ve never seen. Leave the city though, and you can see some spectacular sights. My highlights include bridges made from living tree roots (as seen recently on the BBC’s Human Planet rivers episode), rhinos and tigers in the Kaziranga National Park and breathtaking waterfalls in the wettest place on Earth. However this is a blog about astronomy, and therefore is not the place for me to be sharing my holiday snaps! This holiday was planned and booked around the time that I signed up to be a STEMNET School’s Ambassador and, full of new-found confidence, I mentioned to my Mum in passing that it might be nice to go into one of the schools while we were in Shillong to talk a bit about astronomy. I soon realised that this was probably a foolish idea, given that I was yet to even give a talk at a school in the UK. However by then it was too late – my Aunt had enlisted the help of a teacher friend and organised for me to go into their old school, St Mary’s, to talk to a group of 14 – 16 year olds. As is usually the case with me when faced with a daunting task, I then proceeded to pretend it wasn’t happening, somehow assuming that my talk would write itself! And so I found myself, in the last hour before we left for the airport, frantically saving any and all pictures I thought I might need from the internet, and trying to get Chromoscope to work on my laptop, with the intention to write the talk on the flight. Needless to say, that plan failed and, to cut a long story short, I only finished the slides the night before the talk. 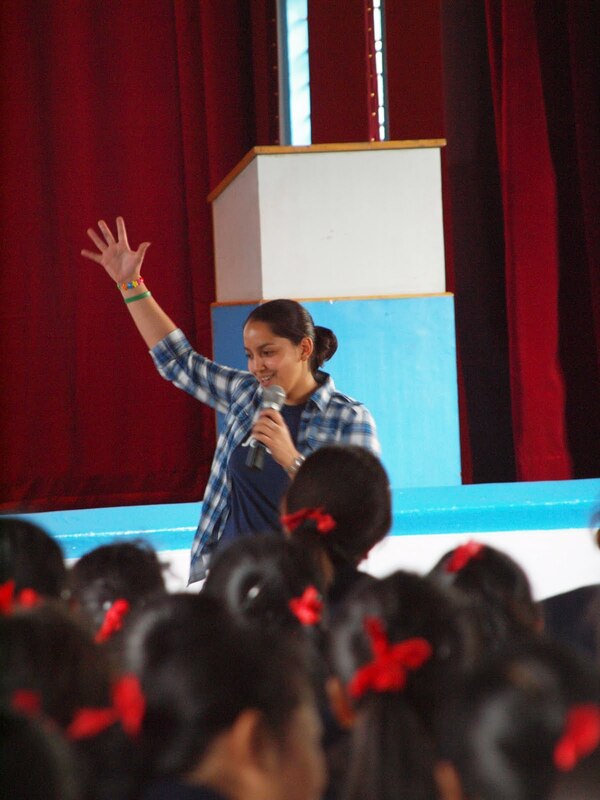 The next day, armed with my laptop and a cheerleading team consisting of Mum, Aunt and sister, I found myself in the auditorium in front of 160 schoolgirls, being introduced by the school’s Vice-Principal. A little different from my assumption that I would be in a classroom with maybe 50 students! I then spent the next half an hour telling them as much as I could about the Invisible (multiwavelength) Universe, finishing with a bit about the Square Kilometre Array, trying to inspire them by explaining how they could be be the PhD students and post-docs working on the project by the time it’s (hopefully) completed in 2024. After the talk, as to be expected, there were a lot of questions. I got the usuals about 2012 and the demotion of Pluto, but there were some other great ones such as why do galaxies have supermassive black holes in their centres and what would happen to life on planets when their star dies. The questions kept coming until the girls had to go to their next class but I could have stayed there all day. My feelings were echoed by one of the science teachers who fed my ego by saying she could have listened to me all day! The obligatory cup of tea followed (I really should learn to like the stuff!) and I left the school with the biggest grin on my face. Overall I think it went pretty well. Yes I could have been more prepared. Yes I could have spent more time making my slides looking pretty (and getting Chromoscope to work instead of having to show screen shots). I probably could have spoken slower and refined some of my explanations (I’m not sure that spinning round with my arms out to illustrate a pulsar was the best idea) but I hope that my enthusiasm and love for astrophysics shone through and at least one of the girls looked up at the sky that night and understood a little bit more about our Universe. 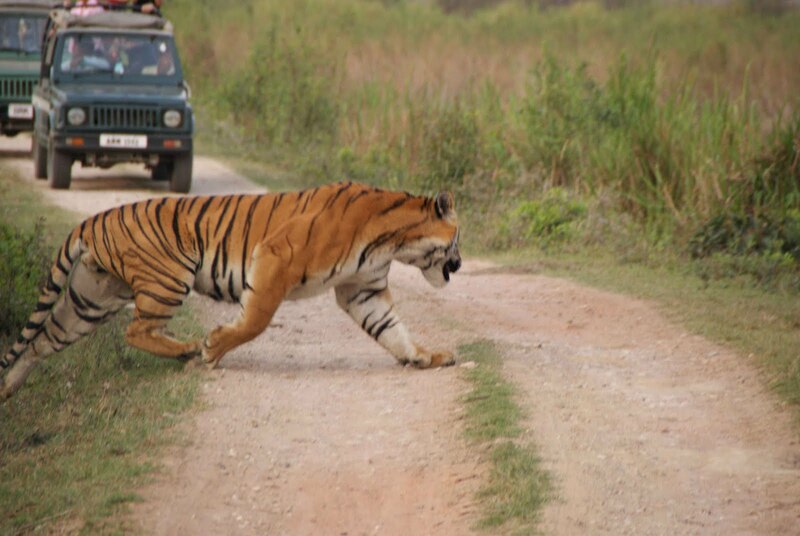 Oh, and did I mention we saw a tiger?